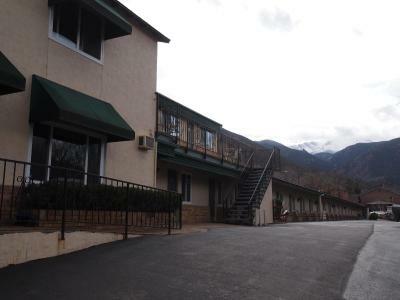 Lock in a great price for Eagle Motel – rated 8 by recent guests! Best in town locale and the owner was so accommodating. The room was spacious and extremely clean. 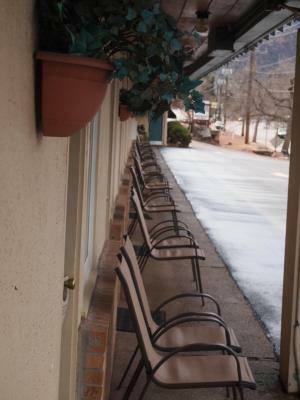 There are chairs outside of each room to sit and relax. The view outside my door was excellent. The staff friendly and helpful. 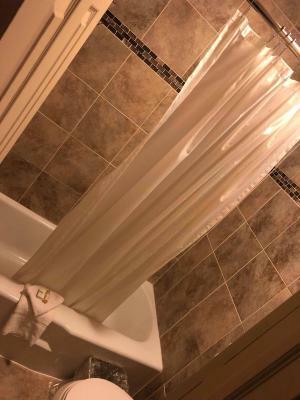 This is a very clean location. It was very homey feeling and the staff was super nice. 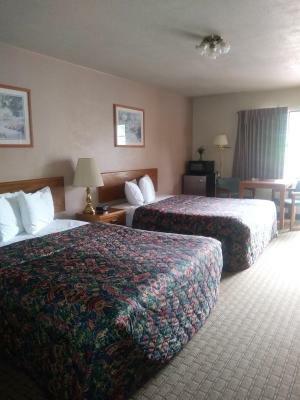 The price was lower than other motels closers to the base. The room was clean upon arrival. There's is a free bus system to get around the area. Great location. 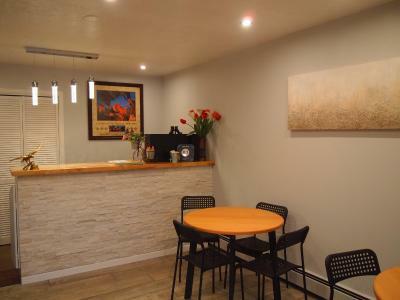 Within walking distance to restaurants and shops. Nice parking. View of the mountains. All rooms on ground level. Friendly staff. Good pressure in shower and plenty of hot water. I can say that I’m going again, it’s a wonderful place for a good night out with my honey! 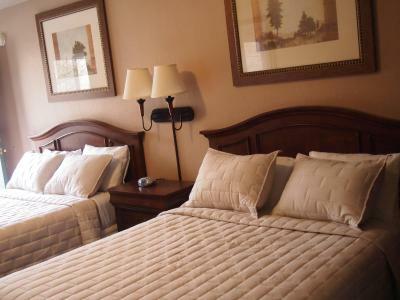 Staff was great, room was clean and comfortable, location was good. Exactly what we were looking for. Owner very nice. Walked right across the street and caught the free bus to downtown. Great view of Pikes Peak from hotel. Chairs right outside room for the evening where we sat and met other guests. 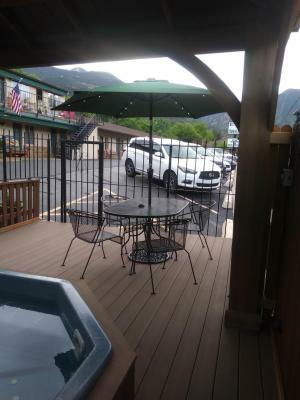 Eagle Motel This rating is a reflection of how the property compares to the industry standard when it comes to price, facilities and services available. It's based on a self-evaluation by the property. Use this rating to help choose your stay! 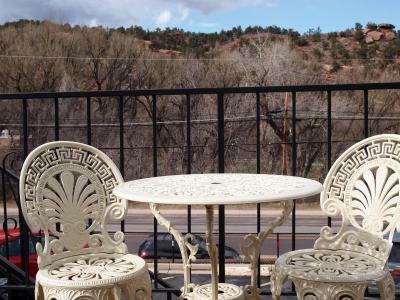 Featuring a seasonal outdoor hot tub, this motel is 15 minutes’ drive from Garden of the Gods. 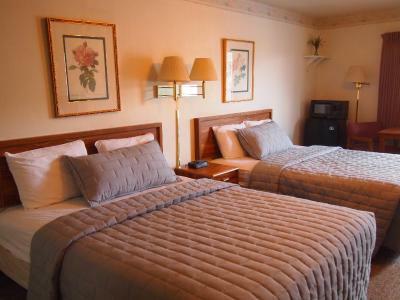 All rooms are equipped with free Wi-Fi. 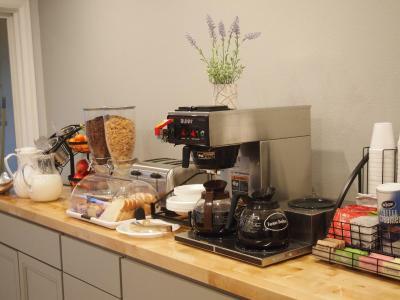 A free continental breakfast is served daily. 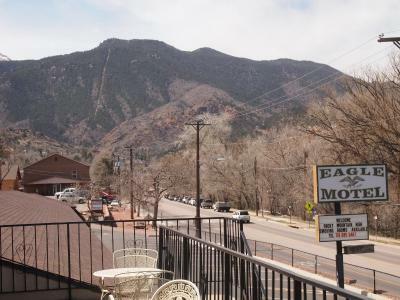 Rooms provide you with a seating area with a satellite TV, coffee-making facilities and an private bathroom at Eagle Motel Manitou Springs. 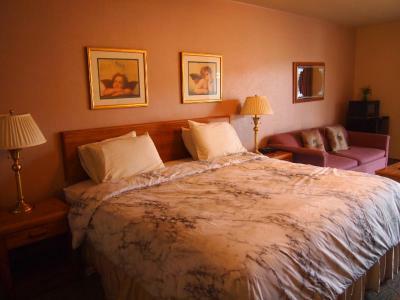 Select rooms offer a microwave and a small refrigerator. 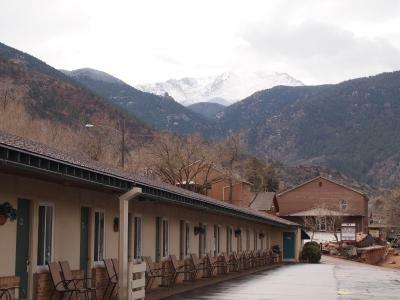 Free parking is provided at Manitou Springs Eagle Motel. Vending machines with snacks and drinks are available. 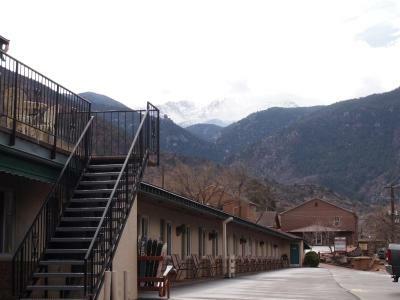 United States Air Force Academy is 30 minutes’ drive from the motel. 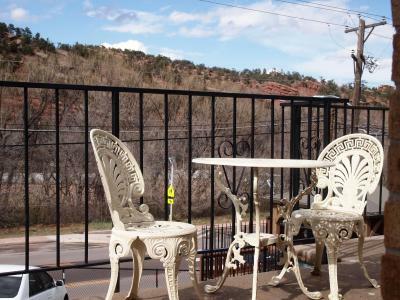 Pikes Peak Cog Railway Station is 2 miles from Eagle Motel Manitou Springs. 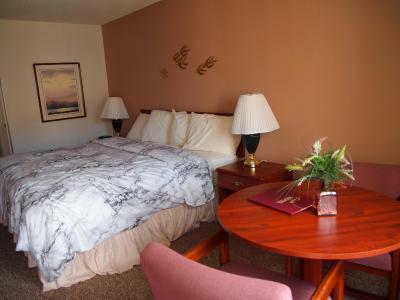 When would you like to stay at Eagle Motel? 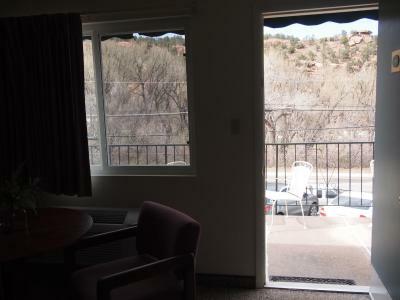 This air-conditioned room features a sitting area, cable TV with satellite channels and a private bathroom. 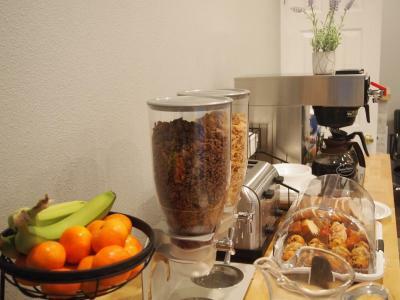 A microwave, a small refrigerator and coffee-making facilities are also included. 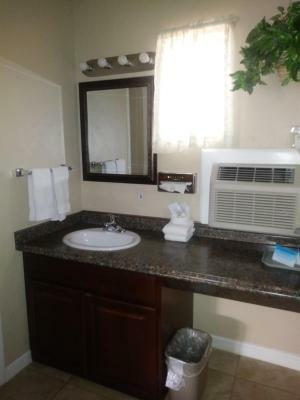 This air-conditioned room features a sitting area, cable TV with satellite channels and a private bathroom. Coffee-making facilities are also included. Please note that there is no elevator access to this room. Guests mus walk up a flight of stairs to access this room. 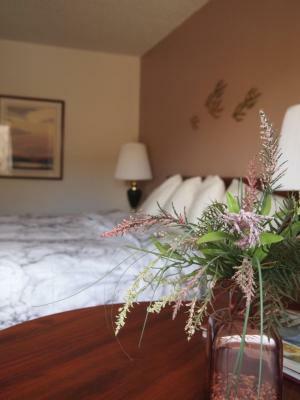 House Rules Eagle Motel takes special requests – add in the next step! 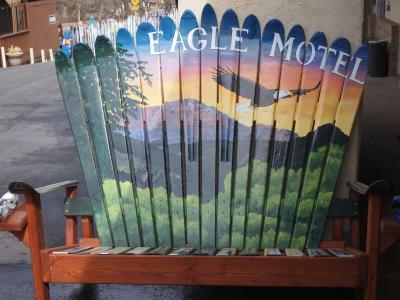 Eagle Motel accepts these cards and reserves the right to temporarily hold an amount prior to arrival. Please note that the daily breakfast offered at this property is a continental breakfast. Guests arriving after 20:30 are required to contact the property in advance to make check-in arrangements. Please inform Eagle Motel of your expected arrival time in advance. You can use the Special Requests box when booking, or contact the property directly using the contact details in your confirmation. Occasional road noise. Office not open when I left. The hotel itself is a little closer to the road than I would have liked but it was not really an issue. All the other hotels in the area are situated the same way. Window with a view of a wall. The shower was very small for a small person (my travel friend) and I am a large woman. Not comfortable at all. The shower had low water pressure and, although didn't freeze it also didn't get to a comfortable warm/hot temperature. Maids missed our room the firstor ingredients, but we're in the second.